There is nothing more traditional than baking a flag cake for the Memorial Day and for 4th of July! Have you ever made it? I sure have! Taste of Home Magazine made the traditional flag cake ever sweeter this summer. The Taste of Home Magazine created a new flag cake recipe and partnered with The USO for a great initiative to give military families the chance to speak to their loved ones overseas by donating 10¢ for each unique visitor to their new Flag Cake recipe on the magazine’s website Taste of Home will be donating 10¢ per click, which equals 2 minutes of talk time for service members and every $1 raised will provide 20 minutes of talk time for service members and their families . Taste of Home will be donating up to $100,000 to the USO for this initiative. 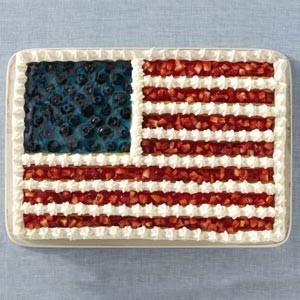 Please check out the new Flag Cake and all of their other recipes for the Memorial Day weekend! I have always wanted to make one of these but somehow I let it slip by me during the summer months.